Home Shimla Which one is better Nainital, Shimla or Mussoorie? Are you planning your vacations and are looking forward to choosing the best hill station as the destination? If so, then you would certainly have felt the dilemma of choosing in between the popular choices – Shimla, Nainital, and Mussoorie. All the three destinations are distinguished than the other and offer different benefits for traveling. As a travel lover, most of the people love to cover all the three locations so as to explore the maximum of their offerings. Although, if you are a concern to make a choice in between these three choices, then the following mentioned information would certainly help you. Modes of transportation: Mussoorie makes the best option when it comes to transportation. The roads available in Mussoorie are in extremely good condition along with being clean and comfortable for traveling. Vehicles are also allowed till late night on the roads of Mussoorie whereas both Nainital and Shimla prohibit the entrance or takes longer time. Weather conditions: In terms of weather conditions, all the three places make the best choices. You will love the peaceful and calm surroundings of the places. The picturesque locations and the green surroundings would certainly attract you once and all. All the places have this pleasant atmosphere throughout the year and thus can be visited any time in the year. Another advantage of having such pleasant surroundings is that you can try the various adventures there like that on Shimla Jakhu ropeway. The pleasant weather conditions enhance the overall experience of the adventures. The variety on Mall Road: If you are one of those who love to shop while visiting different places, even then you will not be disappointed by any of the places. 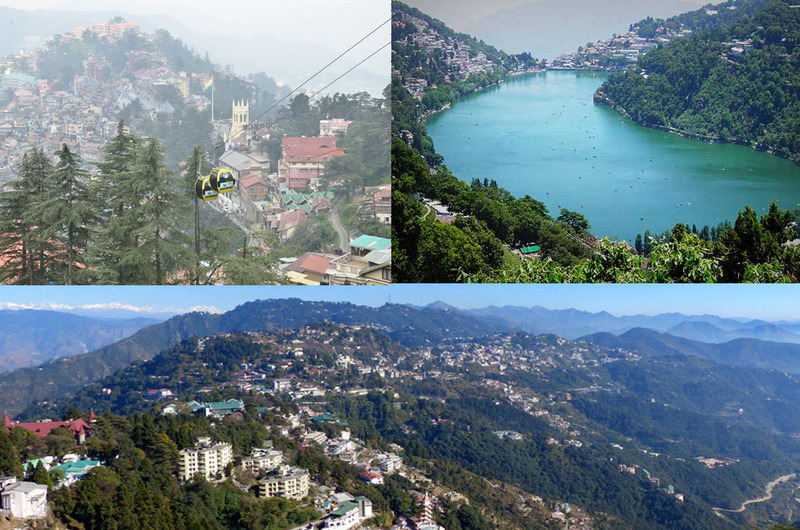 You get some amazing variety of stuff in the Mall road of Nainital which will make visiting the place worth. But if you are looking for some real authentic stuff, then you must visit the Mall roads of Mussoorie or Shimla. However, the best Mall road is that of Mussoorie but even the quality of Shimla’s Mall road is unmatched. The different varieties of options along with the affordable price range are some of the reasons that you should visit these places for shopping for real good stuff. Attractive places: When you are visiting any place, one of the major concerns is that of exploring different places, isn’t it? If this is what that excites you as well, then you would love all the places equally. Each of the mentioned places has something or the other to offer like the Shimla Jakhu ropeway, which would bring in a whole different kind of experience. For us, Shimla makes the perfect destination out of the three mentioned destinations. However, we strongly recommend visiting all the three places.